The BuckAlloy™ Aluminum climbers provide strong, lightweight comfort for total confidence while climbing. 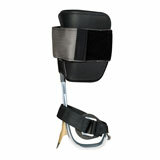 Model A95089V35021C features 21401C velcro bottom straps and 35021C cushion wrap pads with cinch and metal insert. The American-made BuckAlloy™ Aluminum Tree climbers are the most durable and most cost effective lightweight climber in the industry. The BuckAlloy ™ tree climbers feature a new hybrid gaff and Buckingham’s Patent Pending GRiP (Gaff Ridge Position) technology. Whether you are climbing a tree with thick bark or thin bark, the hybrid gaffs, measuring in at 2 7/16”, gives the user the convenience of keeping one gaff on the climber at all times. The users no longer need to worry about teetering on a gaff that’s too long, or cutting out on a gaff that’s too short. The hybrid gaff also gives the user unmatched comfort as the tip does not sit below the bottom of the stirrup. In addition to the hybrid gaff, and making the BuckAlloy ™ tree climbers one of Buckingham’s most innovative yet, these climbers feature GRiP technology that keeps the gaff pointed toward the heart of the tree. GRiP technology aids in preventing cutouts, allowing for better, more comfortable setting of the foot and arch, and allows the user to climb in a more natural, upright position. An angled style hook and loop pad that a continuous wrap and a metal insert and cinch to fit the BuckAlloy™ Aluminum Climbers. Measures 4″ W with 3/4″ padding. Requires no top straps. The BuckAlloy™ Aluminum Tree climbers feature nylon bottom straps (P/N: A21391) and are rated to 350 lbs., exceeding ASTM F887 standards. A dowel & screw design allows for easy gaff change out if needed.